Swimming started in the 1st century. Swimming has been a part of the Olympics since 1896. Some people think swimming started when a person fell into the water and panicking, he started to swim in a way we call today dog paddle. Egyptians made a picture or symbol for swimming as far back as 2500 A. Peanuts are a source of energy for swimmers. 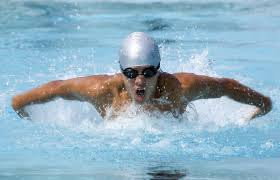 Drags slow you down in swimming because they are not skin tight. The shorter your hair is the more chance you have for swimming faster because there is less friction. Swimming can be done for competition and it is helpful in survival. 65% of people in the U.S. don’t know how to swim. You can swim for exercise no matter what your age. Some people teach their infants and toddlers how to swim so that they will learn to love and respect the water at a very early age. I also know people well into their eighties who swim regularly to stay in shape. An estimated 65 thousand people in the United States alone do not know how to swim. Many of them learned as young children but never go to a pool, lake, river, or ocean anymore and have forgotten how to swim over the years. Others were never taught and continue to avoid the activity altogether. It was once thought that knowing how to swim was important for safety reasons, but now it is pretty much left up to the individual. Swimming in extremely cold water can be very dangerous. People with heart conditions or other ailments, as well as elderly people, should avoid swimming in water that is too cold. Cold water cools down the human body 25 times faster that cold air does, so swimming in water that is below about 15 degrees Celsius should never be undertaken. This can lead to thermal shock, hypothermia, and eventual death. Swimming is also a very safe form of exercise because it is considered to be low impact and easy on the bones and joints. You can do exercises in the water using floats and weights and enjoy a good workout without worrying about serious injury. This is especially true if you have arthritis or other types of physical limitations. It really is true that you shouldn't swim for about an hour after eating. This is primarily because your body is digesting your food and you may get a cramp during the time right after you eat. Allow your body to rest after eating and then go into the water. Swimming is a good way to lose weight. This form of exercise will stimulate your entire body and could lead to an increase in metabolism over time. If you are trying to lose weight, swim for at least twenty minutes three or four times each week. Going swimming is very relaxing and has been compared to yoga and meditation in terms of its soothing effect on the mind and body.